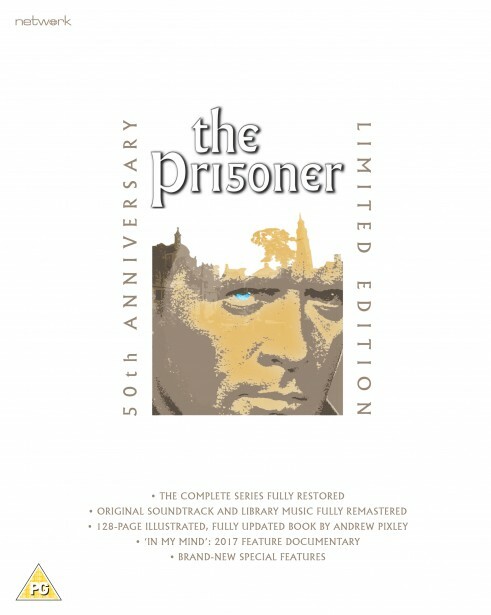 Fifty years on from its first UK broadcast, The Prisoner remains as fresh and dynamic as when it was first unleashed upon an unsuspecting world in 1967.
a brand-new, feature length documentary in which director Chris Rodley recalls his 1983 efforts to interview Patrick McGoohan for a Channel 4 documentary. The film features interviews with Catherine McGoohan, rare archive footage and never-before-seen interview sessions with McGoohan himself. Andrew Pixley’s updated history of the series illustrated with rare and never-before-published photographs. This release brings together all of the specially-composed music and library tracks in one collection for the first time, along with many alternate and unused takes. all 17 episodes, presented with new text commentaries on each episode, detailing the production history. a new short revisiting the original locations used in the Prisoner. newly-discovered home movie footage of the filming of Arrival. These two episodes, both relevant to the Prisoner, are presented here in High Definition. featuring rare and never-before-seen photographs from official and personal archives. reflects on her father's work and legacy. in a rare appearance to talk about the series, Patrick McGoohan is interviewed by Warner Troyer in an exclusive programme for TV-Ontario from 1977. Recently discovered 16mm Kodachrome amateur footage of Portmeirion showing the early days of its development circa 1939. Pathe News' initial visit to Portmeirion in 1939 presents the first opportunity to give the village mass exposure via Britain's cinema screens. Pathe News returns to Portmeirion in 1962, this time in Technicolor. Producer Leslie Gilliat was assigned to The Prisoner in the early stages of the project and visited Portmeirion in 1966 to photograph the village. These 35mm transparencies are the results of that recce and present some initial ideas for the buildings' use in the series. A selection of trims from Arrival, Many Happy Returns, The Chimes of Big Ben and The Girl Who Was Death. Radio 1 DJ Simon Bates was given a rare opportunity to interview Patrick McGoohan when he visited the NEC in Birmingham to be presented with a Caterham Super 7. An outtake from one of Chris Rodley's full interview sessions with Patrick McGoohan for the original Six Into One – The Prisoner File documentary. Discovered in 2006 in ITV's vaults, this showreel is an example of what Lew Grade would have shown to his US network clients in their preview theatres in pursuit of a sale. It hasn't been seen beyond its original use in 1967.